Your golf cart is an investment in your game. Why add stress—and thus strokes—when you’re on the course by struggling with a poorly performing golf cart? Regular golf cart maintenance and care will keep your vehicle humming along quietly and smoothly. When it comes to golf cart care, think in terms of prevention. Regular TLC will keep your electric cart from breaking down and prevent what can be high golf cart maintenance costs. We’ll explore each of these to provide you with specific tips for maximizing your golf cart’s performance. Ours is an overview of golf carts in general. Each golf cart brand has unique engineering and thus maintenance procedures. If you don’t have a manual but want one, visit Golf-Carts-Etc. as a helpful resource for obtaining what you need. 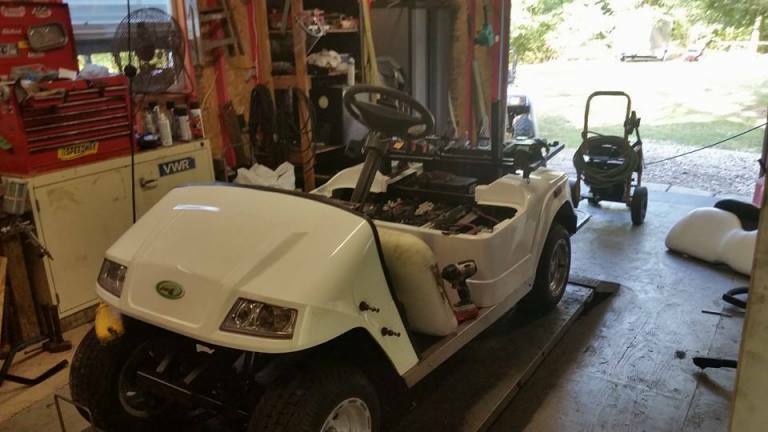 Even when you provide your own golf cart care on a regular basis, it’s a good idea to have a yearly tune-up by golf cart maintenance and repair professionals. Service technicians can perform system checks and make adjustments and repairs that most people are unable to do at home for lack of equipment or know-how. Approximately once yearly, have a professional check your brakes and make needed adjustments or repairs. If you notice your brake performance deteriorating, go in immediately rather than waiting for your yearly check-up. It’s necessary to have a pro inspect your suspension and steering. The technician will check for wear and tear as well as loose nuts and bolts. He or she will check for problems, make repairs as needed, and lubricate everything to keep it operating at the optimal level. Lubrication is essential for many parts of a golf cart. When your golf cart has its 12-month checkups, the mechanic will lubricate all systems and components. Some people lubricate parts of their cart on their own on an as-needed basis, but it is okay to have a service professional do so at maintenance appointments. Push your golf cart slightly when it’s parked. If it doesn’t budge, your brakes are too tight. If it rolls, they’re too loose. Perform a quick visual inspection to make sure the brakes aren’t dragging. Notice the feel of your brake pedal. If it feels too loose or lower than usual, have it checked. If your quick check reveals a problem, schedule service right away. Brakes that are too loose or too tight can be dangerous. Dragging brakes make the golf cart work too hard, placing the batteries at risk of overheating. Replacing overheated batteries is much costlier than a break (or other) repair call. Maintaining your electric golf cart is not that bad of a task. There are just a handful of upkeep tasks. We’ll walk you through them here, so you can do them quickly and confidently to keep your cart in top shape. If your cart has a Tow/Run switch (most do), set it to Tow so you aren’t working on an active cart. Check your tires monthly. Doing so will help prevent bigger problems from developing. Inspect for both pressure and alignment. Many golf cart tires need to be inflated to 22 pound-force per square inch (psi). Both over- and under-inflation can wear out tires prematurely, and improper inflation can negatively affect the performance of your cart. Poorly functioning tires, for example, can slow your cart down. Ideally, you’ll have hit your ball so far that you want to be able to hop in your cart and zoom up to it. Make sure your tires don’t hold you back. Alignment must be correct for cart performance and tire longevity. If you hit an obstacle in the form of a curb, landscape ornamentation, pothole, or whatever else is in the way, it’s wise to have your cart inspected and adjusted. Golf cart battery maintenance is quite likely the most critical aspect of the care of your cart. Caring for your battery is crucial for getting the most out of your golf cart and its performance. If you care for a cart battery well, its lifespan is approximately four- to six years. Considering that an electric golf cart, depending on the size and type, will have four, six, or eight very powerful—together creating a 36- or 48-volt electric drive system—spendy batteries, it makes financial sense to care for your batteries to extend their lives. Before looking into how to do these steps, it’s important to know how to be safe. First and foremost, charge your battery often. Charge them after every use, even short trips out. Also, if you’re storing your cart for any length of time, you should charge your batteries every 45-60 days. Letting your battery completely die is hard on it and will shorten the life. The general recommendation is that batteries should be charged when they are about 50- to 80 percent discharged. Just as entirely draining a battery can damage it, so, too, is overcharging. Depending on how depleted your battery is, charging time ranges about 8- to 10 hours. Charging overnight is convenient and effective if you have a charger that stops charging on its own. If you have to stop the charger manually, make sure you’re awake and available when the battery is almost full to prevent overcharging. Like people, golf cart batteries need water to “live” and function well. Cart batteries have cells that hold the water; you’ll refill the cells through holes. 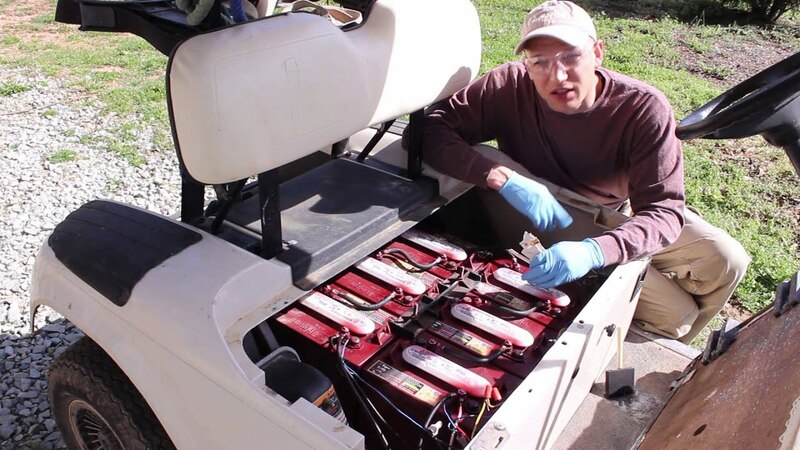 Cleaning golf cart batteries are vital to battery life and overall cart performance. Two main substances can interfere with battery operation: dirt and corrosion. Dirt filters in from gravel paths, riding in the rough, and general outdoor living. When dirt settles onto your batteries, it slowly draws down the battery, reducing the time of use between charges. Clean soil and dust from your batteries often. Quick visual inspections will tell you when a shower is in order. For dirt removal, merely use a hose and blot with an old towel. Corrosion is another problem that can kill your battery long before its time should be up. Corrosion creates resistance within the cables which in turn creates friction; the increasing heat can melt the terminals. Frequently check your battery terminals and cables for corrosion, and clean it off before a build-up forms. Baking soda and water create a wonder cleaner for batteries. A good ratio is one cup of baking soda to one gallon of water. The baking soda neutralizes the acid. 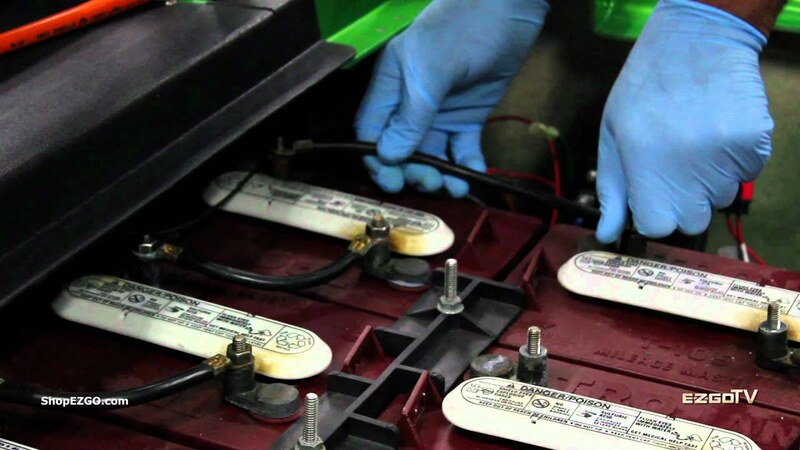 The best location to clean acid off batteries is over rocks, gravel, or dirt. The procedure is straightforward: pour a generous amount of the baking soda solution over the batteries and let it stand for about a minute. Rinse the cleaner away with a hose, and dry it with an old towel. If stubborn spots remain, just repeat the procedure. You can use a brush to loosen the dried acid if needed. As mentioned in the above safety tips, be sure to wear eye protection and gloves when cleaning batteries. If you’d like a detailed description of golf cart battery maintenance, visit the Deep Cycle Battery Store for instructions. Protect your golf investment by performing regular golf cart maintenance and care. Doing so will take one frustration off the course and let you turn your attention to your game.